Is there anything more beautiful than fresh fruit? 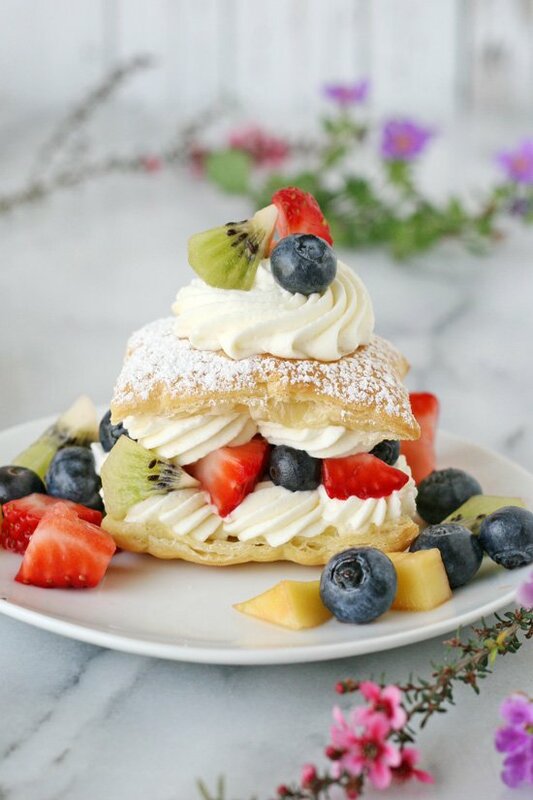 How about fresh fruit with gorgeous lemon cream and a flaky pastry? Now we’re talking! 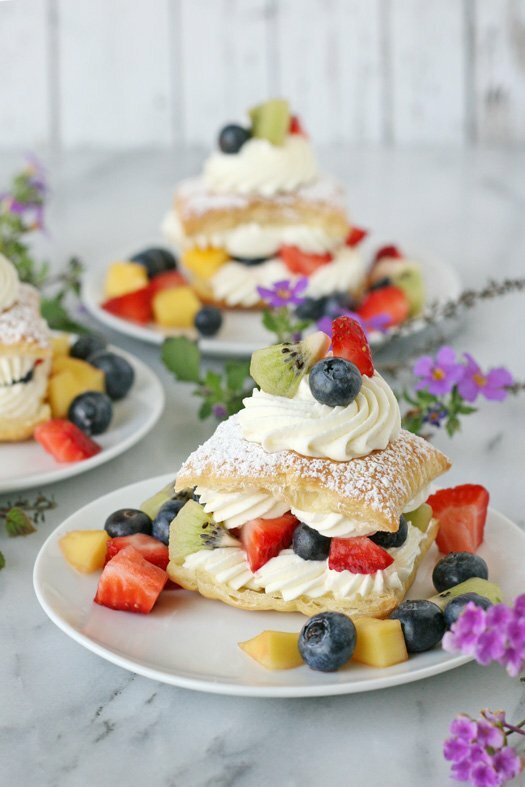 These Lemon Cream Puffs with Fresh Fruit are a beautiful and delicious spring or summer treat! Wouldn’t these be gorgeous for an Easter brunch, a shower, tea party, or a summer dessert? And one of the best things about this dessert is that it’s quite easy to make! With just a few ingredients you can create an impressive treat! The recipe starts with Pepperidge Farm Puff Pastry. 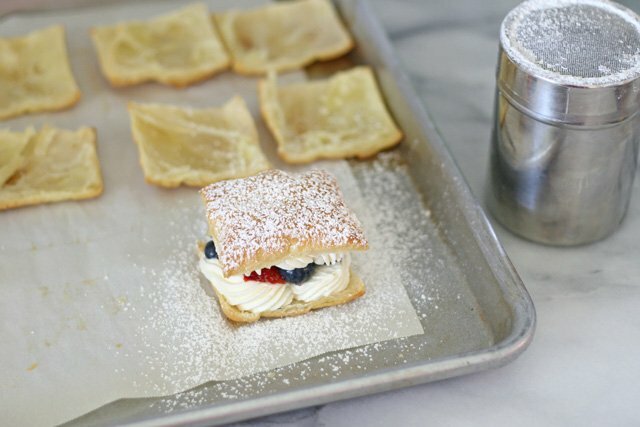 I’ve been having fun working with Pepperidge Farm Puff Pastry for the past several months and have truly found that the options with Puff Pastry are endless! 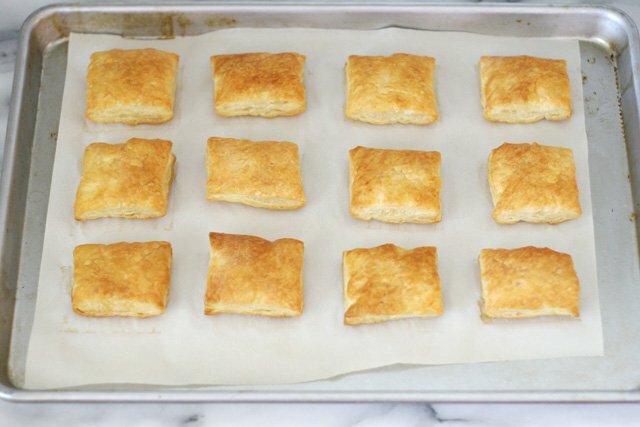 Thaw one sheet of Puff Pastry according to the package directions. Gently unfold onto a lightly floured surface, then use a pizza cutter to cut along the fold lines, then cut each third into four smaller rectangles. Bake 12-14 minutes until puffy and medium golden brown. 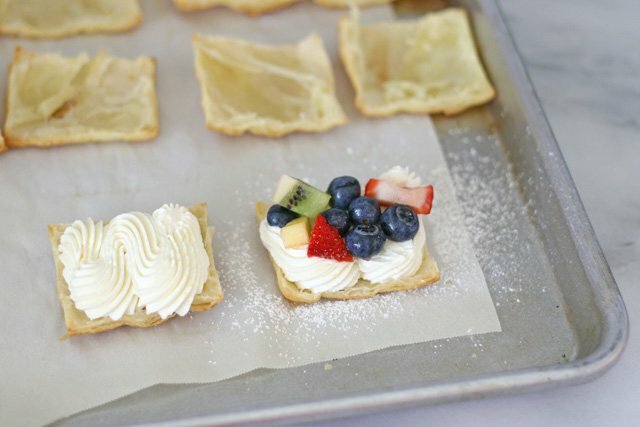 Fill pastry with lemon cream (recipe below) and fresh fruit. Top with powdered sugar and garnish with additional fruit, as desired. This beautiful and delicious dessert is quite simple to prepare and perfect for a spring or summer treat! Thaw Puff Pastry sheet according to package directions. Gently unfold pastry onto a lightly floured surface. 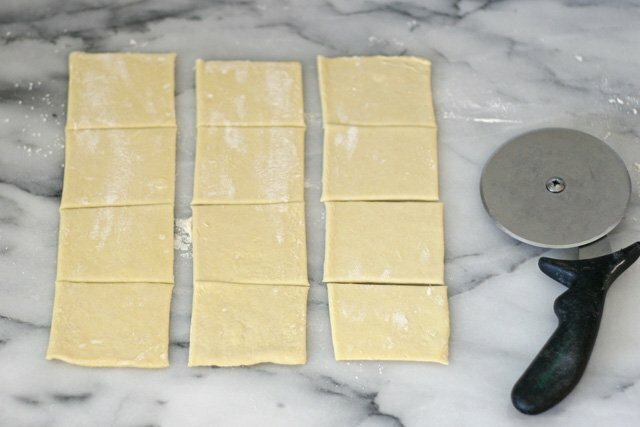 Use a pizza cutter to cut the pastry into 12 small rectangles (As pictured above- first cut along fold lines, then each third should be cut in half, then half again). Bake pastry on a baking sheet lined with parchment paper (or a lightly greased baking sheet). Bake 12-14 minutes (check after 10 minutes). Bake until puffy and medium golden brown. While the pastry bakes, prepare fruit by cutting into small pieces, then mixing together in a bowl. Set aside. Prepare lemon cream by whipping the heavy whipping cream (using and electric mixer) until it begins to thicken. Add vanilla and powdered sugar, and continue to beat until thick and fluffy. With the mixer on low, add the lemon curd, one tablespoon at a time. Stop mixing as soon as the lemon curd is incorporated. Using a serrated knife, cut open each baked pastry (horizontally). 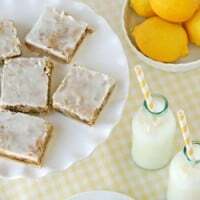 Fill a piping bag (or a ziplock bag with a corner cut off) with the lemon cream and pipe some cream onto both the top and bottom piece of pastry. Add fruit to the bottom piece (as shown), and then add the top piece, creating a sandwich. Sprinkle dessert with powdered sugar. If desired, pipe a small dollop of cream on top and add a few additional pieces of fruit. Serve immediately, or keep the assembled desserts in the refrigerator up to 2 hours. 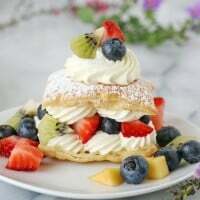 The elements of this dessert (the pastry, fruit and cream) can be prepared ahead of time (several hours) and then the final assembly can be done shortly before serving. For the past several months I’ve been sharing recipe using Puff Pastry and asking you to share your recipe ideas too. Each month I’ve chosen a “top pick” from the recipe suggestions. Those “top picks” were submitted to Pepperidge Farm and they chose the grand prize winner who will join me next month for a day at the Pepperidge Farm Innovation Center in Connecticut. The grand prize winner is… Bethany Gist!! Congratulations Bethany! I’m looking forward to spending the day with you next month! Please continue to share your own original Puff Pastry recipes and/or twists on existing dishes via PuffPastry.com or Pepperidge Farm Puff Pastry Facebook page, and/or by tagging the brand (#PepperidgeFarm) in any Instagram photos. This recipe is lovely!! So yummy! Oooh wow! These looks so beautiful. What a simple idea but it looks so impressive. Your photos are just gorgeous. Oh wow, so pretty! 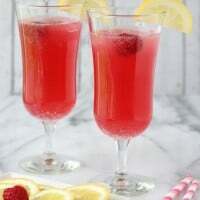 I want to make these now for Easter brunch I am having. I’ve been trying to decide on a dessert. Glory, Thanks for sharing this fabulous dessert. Pinnted this! Your photos are gorgeous. Enjoy your trip to Pepperidge Farm. Glory, these look so pretty and delicious! I can’t wait to try them out for Spring. I am really enjoying your new book too! 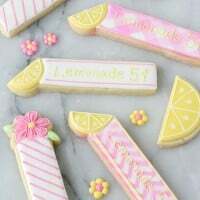 These are beautiful and I bet they taste super yummy! Have fun in Connecticut! Love you! Not only does the dessert look scrummy but the photography is amazing – well done! Your photography and styling is gorgeous. And I know this lovely treat tastes amazing. These are so pretty, Glory! That gorgeous fresh fruit and that lemon cream? Yum. Oh my Glory — I’m craving brunch, and it’s already past dinner time! 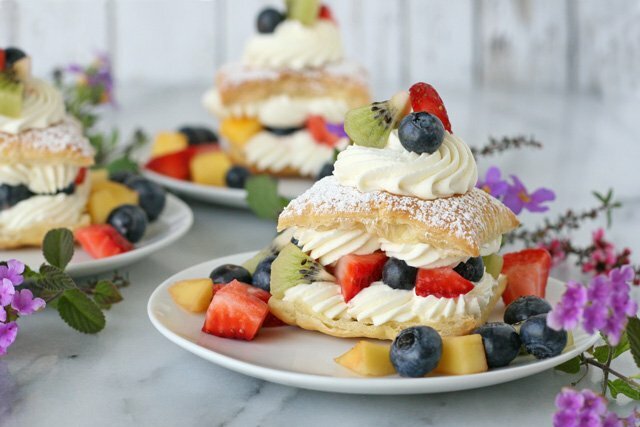 I haven’t worked with puff pastry before, but if it gives me the excuse to eat lots of fresh fruit and sweet lemon cream, I’m all for trying new things! What temperature do you bake the pastry at? Hi Christy, Bake the pastry according to the package directions. I used Pepperidge Farm pastry, but if you use another brand, then follow the directions on that box. I made this recipe last night for dessert and it was wonderful! Will definitely be making this again. Thank you! Just wondering how long these will keep? Do you refrigerate them? Sorry if you already answered these questions! Bah! Found the answer! Thanks! Hello, Let me first say how blown away I am by your awesome creations!!! You are supremely talented and I salute you. Question: How can I prepare these lemon cream puff ahead of time? I am hosting a surprise birthday tea for my friend and want to do as much as possible ahead of time. Today I am so excited!! i am making this for my parents breakfast in bed for their anniversary. I love being 11. Just made these for family, huge hit. 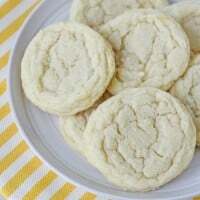 What makes these so special is adding the lemon curd to the whipped cream. Beautiful presentation. Thanks. Would love to try your recipes, but I am always STOPPED by advertisements!!! I can get no further. So therefore, the only thing I can do is ignore your site, and tell friends to do the same. Very elegant and …yummy! I made these for Easter. Very simple to make and even eadier to eat…but hard to have just one!